Someday I hope that I can start a review with a story about a burgeoning cigar star who was raised in the Cuban cigar tradition and never had to leave his homeland. But that story is not yet ready to be told. So the story of Noel Rojas will sound familiar: after working in the fields of Pinar del Rio from a young age and building a solid reserve of knowledge and experience in the Cuban cigar industry he discovered, like so many others, that he would have to leave Cuba to succeed. The Sabor de Esteli Maduro is a pressed cigar, which distinguishes it from its conventionally round sibling in the natural wrapper. The San Andres wrapper is smooth and consistent in color — not pitch black, but definitely well matured. The head of the cigar is well formed, even if the cap is a finished a little roughly. The roll seems a little loose, but the draw is not too easy and the even burn produces a strangely lightweight, but solid ash. The maduro characteristics of this cigar are apparent from the start: bittersweet chocolate is the flavor that rarely wavers here. The smoke is smooth and creamy, but the peppery spice that opens up in the nose and gradually moves to the palate adds a dimension of complexity to the smooth waves of chocolate rising from the wrapper. In the mid-section the pepper eases up a bit while the tannins bear down on the palate. Milder aromatics come forward as the spice dissipates: cedar and coffee predominate, but there is some fruity sweetness here as well. The last third of the cigar becomes earthier. The tannins are heavy and become a little cloying, but the aromatics are good to the last whiff. The body of the cigar is a satisfying medium and the strength moves from medium to full at the conclusion. With no seco or volado in this cigar, I was expecting Sabor de Esteli to be a much more potent smoke. It’s not a lightweight by any means, but it’s not a ligero grenade either. Instead, it’s a smooth and tasty smoke with the flavors one typically expects from a maduro of Nicaraguan provenance: chocolate and wood built on a dry tannic chassis. I often find maduro cigars to be less interesting or complex than their natural brethren, but that can’t be said of Sabor de Esteli. My only criticism is that the smoke is quite dry — a pint of your favored stout or porter might make a nice companion here. Maybe two pints. You won’t find this one next to the King Edwards at the gas station, but with distribution from the House of Emilio it’s not too hard to find. MSRP is around $8 USD for the toro. It doesn’t seem possible that the Illusione cg:4 could be improved upon, but that’s no excuse for not trying. Last year, Dion Giolito went back into the lab and emerged with a new species. By replacing the inimitable corojo wrapper on the “original document” with a maduro leaf from Mexico’s San Andres valley he has essentially re-engineered the cigar. But can the younger sibling can escape the shadow of its glorious brother? Maybe… if it can do something that Big Brother cannot. Like all the other Illusione (with the exception of the Singulare) they are made at the Raices Cubanas factory in Honduras. The maduro wrapper on the cg:4 is not much darker than the natural, but the fermentation and aging process results in the leaf appearing much more mottled. The oily texture of the cigar is still quite appealing, but maybe this impression is the result of experience more than aesthetics. The roll is firm, the cap is picture perfect, and the draw is right in the zone. It burns beautifully (even for a maduro) and leaves a long dirty gray ash. Pretty typical for Illusione. The maduro cg:4 starts in much the same way that the natural does: it’s bright and zingy, establishing the flavors that the “original document” made familiar many years ago. The difference with the maduro is the hallmark of San Andres maduro leaf: the distinct flavor and scent of chocolate and dark-roasted coffee. The core of the cigar is earthy with some cedar notes sneaking in between the coffee and cocoa bean flavors. The sharp acidic and woody flavors with which the cigar opens gradually fade without disappearing altogether. The maduro incarnation of this blend seems to be a little smoother than the natural while remaining in the medium-to-full bodied range. The last third of the cigar is spicier and comes with a sneaky punch. It feels like being the last one at the bar. (I know this feeling from reading only the best dimestore detective novels.) It’s last call and the doors are swinging shut. Even the regulars have stumbled out into the misty early morning. Your glass is dry, your wallet is empty, and the bartender is giving you the evil eye. The sweetness of the maduro has made a hasty escape and now it’s time for you to do the same. The Maduro version of the cg:4 is an immensely satisfying cigar, but the question that always arises is the one that nobody really wants to answer: is it better than the natural? It’s like choosing who is the favorite of your children. You don’t want to do it, but in the deep recesses of your crooked little heart you do it anyway. I guess for me it’s still the natural. 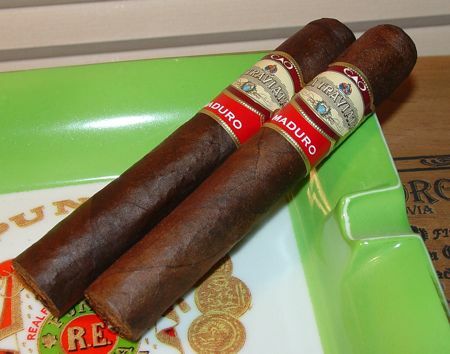 The Maduro is priced the same as the natural, around 8 USD per stick. Not an everyday cigar for me, but not out of reach either. In any case, the price to value ratio is about right. It’s an excellent smoke. Once every five years or so the blenders at General Cigar deem a selection of their aged tobaccos worthy of inclusion in a limited Macanudo Vintage edition. 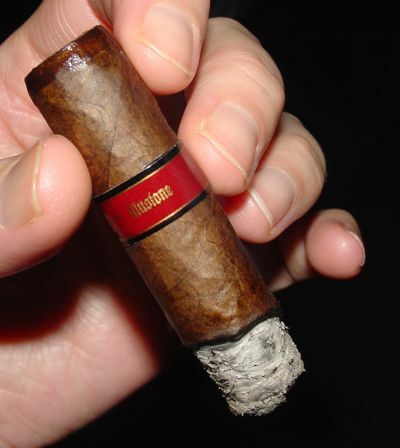 Last year saw the first such release with a maduro wrapper, a 13-year old Connecticut Broadleaf used on the Macanudo Maduro Vintage 1997. The cigar was blended by Edmundo Garcia of General Cigar Dominicana in Santiago. It incorporates Nicaraguan ligero, Brazilian mata fina, two types of Dominican piloto cubano, and a binder grown on Nestor Plasencia’s farm in Talanga, Honduras. 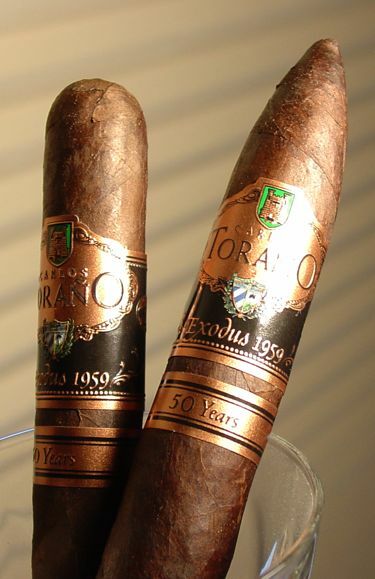 Only two sizes are made, a 6 x 49 perfecto, and a 6 x 54 toro. I am reviewing the toro, obviously. The wrapper is dark but not matte black (an indication of natural processing), and is somewhat rustic despite its rich complexion. The round Cullman style cap is a trademark of the Macanudo line, so it is present here as well. All other construction qualities are excellent — a firm roll, an easy draw, and a solid (but slightly flaky) ash. The burn is surprisingly even for a maduro cigar. As you’d expect from a Macanudo, this cigar is very smooth, but it has a bit more flair than your typical Mac. In the first third there is a fair amount of spice on the nose (though not on the palate) and the smoke is highly aromatic with wood and chocolate scents. The smoke texture is creamy and medium in body. There is a little more heft in the middle section as the flavors grow slightly more robust. The cocoa and chocolate flavors migrate to the palate while the sweetness of the aroma intensifies and adds a touch of char. The big surprise is in the final section of the cigar — a mild bite. Imagine that — a Macanudo with a bite! It is admittedly a playful one, and for the most part the cigar remains smooth with lots of chocolate and coffee notes to the end. This Mac Maddy ’97 is a daddy of a smoke. It’s not tremendously complex, but it’s smooth and packs a whole lot more flavor than I’d expected. All of the flavors you’d expect from a top-shelf maduro are here — chocolate, wood, and sweet char — and it burns beautifully. The going price for this cigar is around 9 USD per stick, but they’re a rare commodity at the moment. They seem to be sold out everywhere, which in itself is a good indication of its quality. When Pedro Martin stepped off his flight from Puerto Rico into the -17 degree cold of a Detroit winter he knew it was time to head south again. Soon after leaving Cuba in 1961 Martin found work with a business associate in Detroit, but it wasn’t long before he planted roots in Miami, working for various tobacco outfits until he finally started Tropical Tobacco in 1978. One of the first cigar shops I patronized as a neophyte stogie chomper was a small discount cigarette shop that had a tiny humidor. I knew next to nothing about cigars, but I grew fond of a cigar they sold called Maya. It turns out that this is an old Tropical Tobacco blend. Later on I found a cheap smoke called V Centennial that I enjoyed as well (even though one bundle arrived with a bonus lesson in tobacco beetle containment.) Also a Tropical cigar, and a good one. Since then I’ve enjoyed many of Tropical’s blends, as well as many of the other cigars that are made with Aganorsa leaf, so I thought I’d go straight to the source and survey the Tropical product line. But first a little more about Aganorsa. When the Sandinista government came to power in Nicaragua, they began the familiar and disturbing process of nationalizing private industry, including tobacco growing and processing. The Cuban government traded assistance in the form of native Cuban seed and expertise in exchange for foodstuffs and other items difficult to acquire under the U.S. embargo. At that time the tobacco industry was known as TAINSA and operated in many of the areas where Nicaragua’s best tobacco is grown. Unfortunately these were also areas beset by political unrest and violence. Around the same time, Eduardo Fernandez and his brother built and presided over one of the largest fast food chains in Europe, a giant called Telepizza. Starting from a single pizza joint in Madrid, the company became the second largest fast food chain in Spain (after McDonalds), and then spread to other countries. When he sold his share in that company in the late 90’s, the Sandinistas were gone and Fernandez was in an excellent position to acquire some of these old TAINSA fields and start a new venture with Aganorsa. Aganorsa leaf is praised and highly sought after by makers of full bodied, Cuban style cigars — some of Aganorsa’s best known customers include El Rey de Los Habanos, Padilla, and Illusione. Though each of these cigar makers has a distinctive style, the similarity is unmistakeable. It’s Aganorsa. The lempira is the currency of Honduras, so naturally the Lempira cigar is entirely Nicaraguan. The discrepancy is probably due to the fact that this cigar has changed composition over the years. It’s one of the oldest brand names in the Tropical catalog, blended by Pedro Martin not long after he first formed Tropical Tobacco in 1978. This incarnation of the Lempira is still blended by Pedro Martin, but it’s a slightly heftier blend that was introduced in 2004 as the Lempira Fuerte. The robustos I smoked for this review were from the 2006 vintage. From the first puff I realized this cigar was going to be one of those very charry tasting maduros — the aroma is bittersweet and woodsy, with a flavor that graduates from fairly mild to rather strong at the smoke’s conclusion. The flavor is somewhat nondescript at first — a little earth, sweet chalk maybe, with a dry finish. 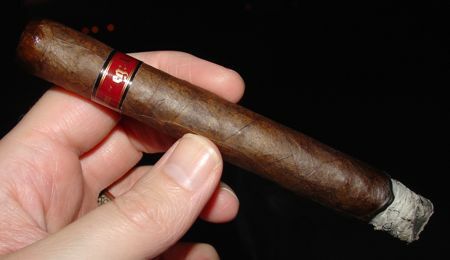 The body of this cigar is also lighter than I expected, but it does eventually ramp it up to about a medium. The middle section features dark roasted coffee — Vienna roast, verging on burnt — with peppery spice on the upper palate. I don’t retrohale most cigars, but this one gains entrance into my sinuses anyway. Intentional retrohaling would probably not be advised with this cigar. The flavors are increasingly bitter on the palate and the sweetness from the wrapper has a hard time maintaining the balance. By the last section this cigar starts tasting more like a charcoal briquette than anything else. At times I thought I detected lighter fluid, but I think that was my imagination. There is a rich meaty aroma that I did enjoy, but it is completely overpowered by the bitter char taste up front. I had a hard time finishing this one. The Lempira Fuerte isn’t a bad cigar, but the flavors here are a little too one-dimensional and bitter for me. I can see how someone who likes the dark bitter semi-sweet flavors of some maduro cigars might get a bang out of this one, but for me it was just too burnt tasting. It scores very well on construction and appearance, however. It’s just not for me. Up next in this series of Tabacalera Tropical reviews: Condega 2006. Here at Keepers of the Flame we support the preservation of formal cigar nomenclature, but occasionally a cigar comes with a designation that challenges our dedication. 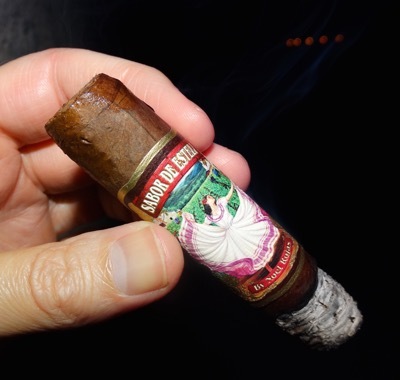 To restore the dignity of this cigar’s title from the abbreviation in the title above, allow me to present La Gloria Cubana Reserva Figurados Flechas Especiales Maduro. But since brevity is the soul of wit (or so I have been told) we’ll call it the LGC Flechas Maddie. In any case, this is a great blend, and one that almost always finds a place in Cigar Aficionado’s annual Top 25. 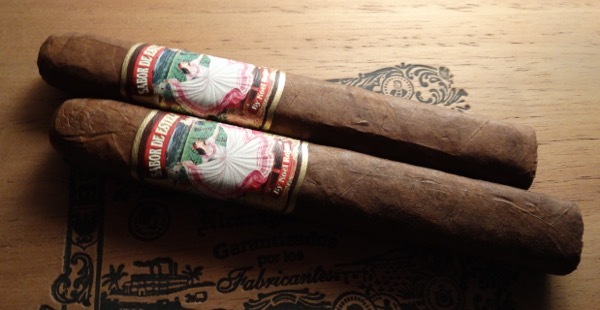 The big news for La Gloria Cubana is that Ernesto Perez-Carillo will no longer be the guiding force behind the brand. LGC was first made in Miami by Ernesto’s father, a former Cuban Senator, starting in 1968, and it has been in the family ever since. Ernesto Sr. nearly sold the brand at one point but decided to keep it when his son decided he wanted a part in the company. Now that son, Ernesto Jr., is leaving the brand behind for very similar reasons: to start a new cigar company with his son, Ernesto III. That’s a lot of Ernestos to keep straight, but as long as they make cigars this good, I say keep the Ernestos coming. The wrapper here is a well aged and fermented Connecticut Broadleaf. Beneath this is 4-year old Nicaraguan binder, and the filler is a Nicaraguan-Dominican blend. According to the General Cigar website, this line undergoes a special “cedar-aging” process whereby the cigar components are aged together in cedar bins for six months. They are then rolled by Grade 7 rollers and box aged for an additional three months before shipping. “Flecha” by the way is Spanish for arrow, a fitting name for this figurado. Despite the fact that this cigar is 6 1/2 inches long, it appears to be much smaller due to its proportions. This is a bouquet style perfecto, meaning it is tapered at both ends, but flared near the foot. The widest point is chosen as the measurement for the ring gauge, so it measures a 49 only at that one point. The remaining length of the barrel narrows, making this a smaller cigar than it appears to be on paper. The wrapper is very dark, even for maduro, but not so black as to be suspicious. 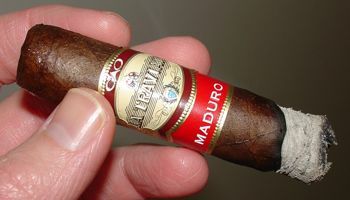 (In other words, it is certainly a naturally processed maduro leaf.) The pre-light aroma is of rich tobacco with a hint of cedar. The roll is solid all the way around, but one of my samples had a little crook in the head section. Maybe a level 6 roller was sitting in relief that day. The burn on all of these has been absolutely perfect: straight as a plumb line, and leaving a solid gray ash to remember it by. The draw tends to be a bit tight until the point burns off, but after a few minutes it’s all good. 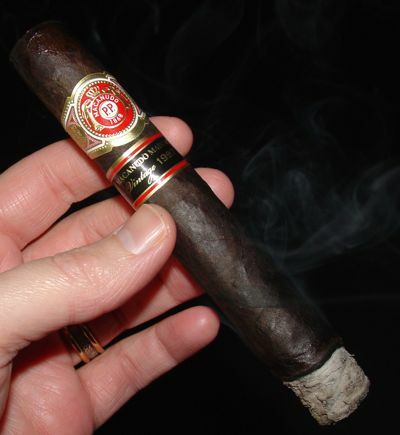 The Flechas Maduro took a few minutes to hit its stride due to a tight draw at the start. 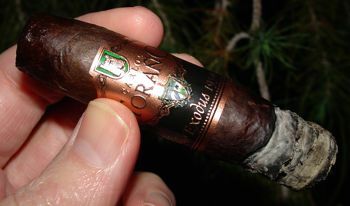 The first flavors are straight tobacco with a little char and it tends to taste a little papery. As soon as the foot opens up the flavors become richer as expected. Cedar makes an entrance and the aroma gets sweeter. There is a little licorice in the aftertaste. The middle section features more cedar and throws in some roasted nuts. The licorice fades and the aftertaste becomes sweetly chalky. The smoke texture is medium to full in body, but at all times the smoke is full flavored. The last section, up to the band, is where this cigar returns dividends. Here the aroma is at its most powerful — smoky cedar and sweet hickory in abundance. The flavor is almost meaty at times, but retains most of the previously mentioned attributes — nuts, earth, and rich tobacco. It’s a complex, but smoothly integrated brew. The Flechas Maduro carry a premium price of 8 to 9 USD per stick, but I do believe they are worth this asking price. My only hope is that General can maintain the quality of this cigar now that Ernesto Perez-Carrillo is no longer at the helm. And given his track record with LGC and El Rico Habano, it goes without saying that we await with baited cigar breath Ernesto’s new blends. Patrick A. gives the Flechas Maduro 4 out of 5 stogies for the Stogie Guys. 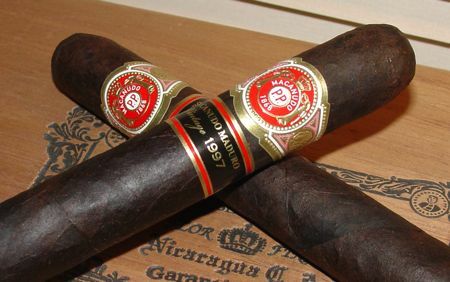 Cigar Jack finds the Regalias Maduro to be full flavored but less bold than the LGC Serie R.
Herfs up for the Cohiba Club as they give the Selectos de Lujos Maduro an 89.